Most optimal, efficient and easy to build is a classic dish antenna which consist of actually dish which acts like a mirror and some receiver at the focal point. Unfortunately 21 cm band requires a quite massive receiver so you can’t use a small dish. Also to achieve some reasonable resolution you need to use bigger possible antenna. Where λ is a wavelength (0.21 meters) and D is a diameter of the mirror (3 meters). My antenna came as just a dish without any receivers and even without stands to secure receiver at the focal point. I needed to create this stands from the scratch. Ideal material is an aluminium tubes of good reasonable diameter. But before cutting tubes it’s good idea to figure out where is a focal plane of this mirror. Focal distance of this antenna was totally unknown. There are few ways to find this distance. Where D is diameter of the mirror and h is a depth of this mirror. Don’t forget to use the same magnitudes in a both parts of the formula! So I found focal distance of the my antenna. Diameter is 300 centimeters and depth is 47 centimeters. Focal distance = 300*300 / 16 * 47 = 9000/752 = 119.68 centimeters. Another way is experimental. You can use strong source of light (the Sun), direct antenna to this source and manually find point of the max intensity. Yeah, this can be very tricky for such big antenna and for the light. In early experiments I’m using the Sun as strong source of the wideband radio noise. As control recieiver was used cheap satellite tv lnb and analog satellite finder with an arrow indicator. To achieve maximum performance of the whole antenna we need to place complex construction at the focal plane. 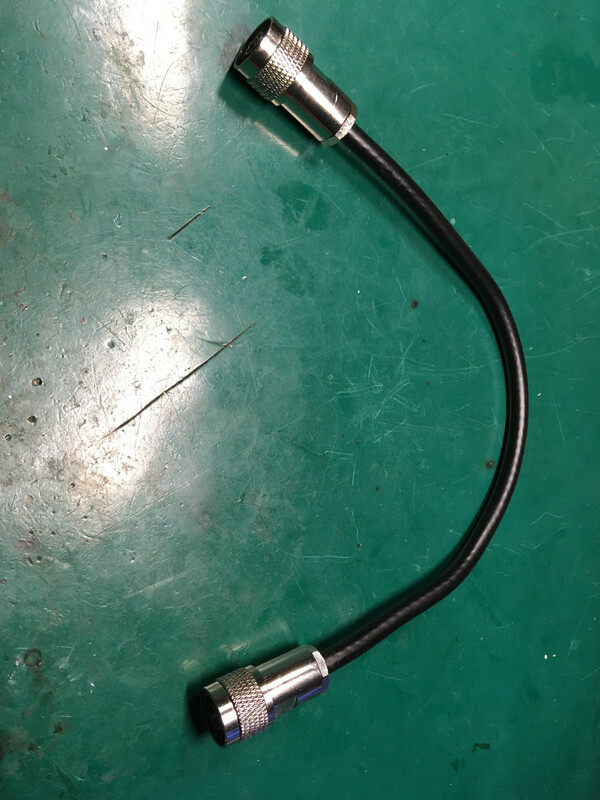 This construction consist of waveguide which is actually a tube with length and diameter selected for the band and a choke ring. 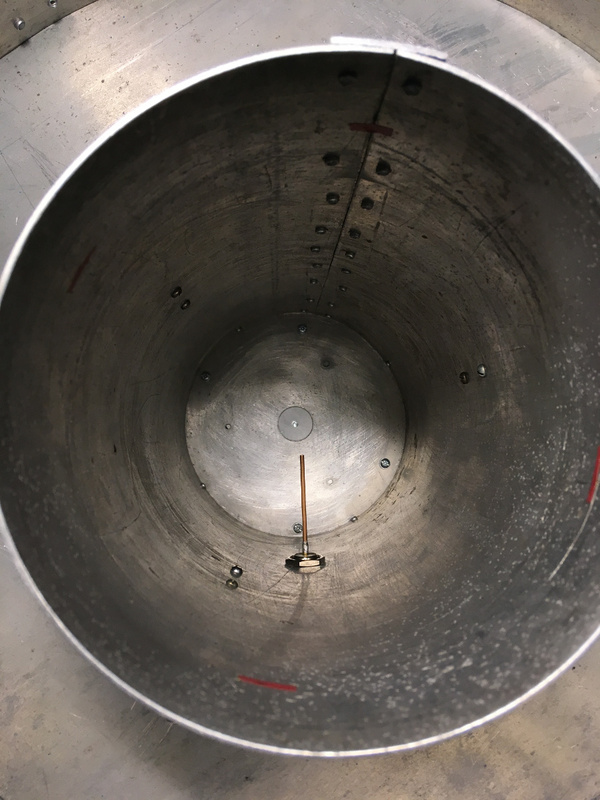 Purpose of the choke ring is to use maximum area of the dish without losing incoming signal and without acquiring terrestrial noise from the dish edges. Waveguide and ring is also made from aluminium and secured with rivets. There are few formulas to calculate length and diameter of the waveguide and diameter, depth, and placement of the choke ring. Waveguide diameter has impact on minimal and maximal wavelength, acts like a bandpass filter. Please note that length of the wave inside the waveguide is longer than in open air. I choosed waveguide diam as 14.5 centimeters so my cutoff frequencies is 1.21 GHz and 1.59 GHz. This is very good, maximal resonance is somewhere in between which is optimal. Where λ1 is wavelength in a open air – 21 centimeter and λ2 is a minimum cutoff frequency which was calculated above (24.7 centimeters in my case). So with waveguide diameter as 14.5 cm internal wavelength is 40.8 centimeters! Total length of the waveguide can be set as minimum two quarter wavelength inside the waveguide, optimal value is three quarter. So length of the waveguide 40,8÷4×3 = 30.6 centimeters. Now let’s talk about the choke ring. Where λ is again our wavelength – 21 centimeter. So depth of the choke ring is 10.5 centimeters. Where h is depth of the choke ring and D is diameter of the waveguide. Position of the choke ring can be obtained experimentally. I believe that optimal is when the outer edge of the ring and the outer edge of the waveguide at the same level. Actual receiving element is a probe that placed inside the waveguide. 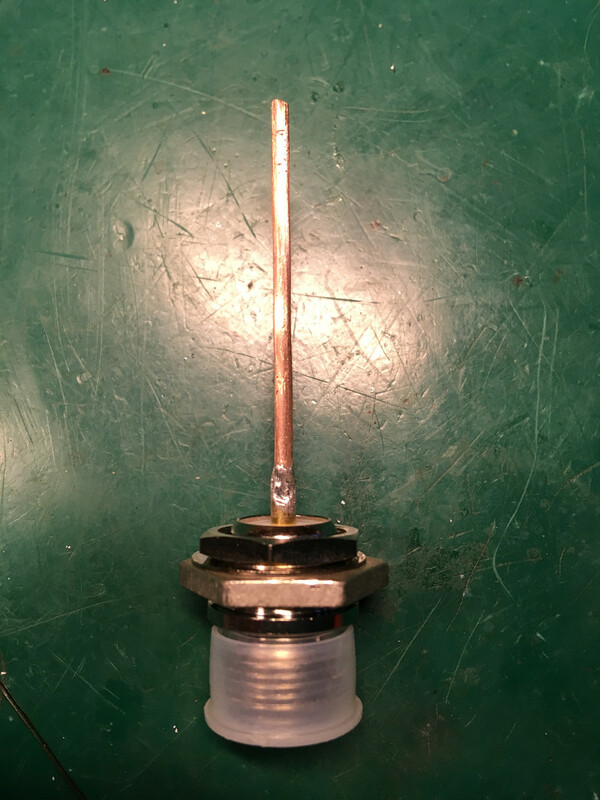 This is a copper rod of small diameter (thick wire can be used) which is soldered on N-type RF connector. This probe should be placed in one of the maximum energy points inside the waveguide. See picture below. Probe placement in my case is 10.2 centimeters from the waveguide’s dead end. Probe length should be 1/4 of the open air wavelength or 21/4 = 5.25 cm. All this construction requires some calibration. As you can find in the electronic table above – focal plane is placed somewhere inside the waveguide. Position of the whole waveguide with the choke ring should be adjusted to achive maximum signal level. As “reference” signal source you can use the Sun or artificial satellites, like INMARSAT. As you can on the photo in the beginning my mounting system with stands allows to move and align this receiver with a few screw-nuts. 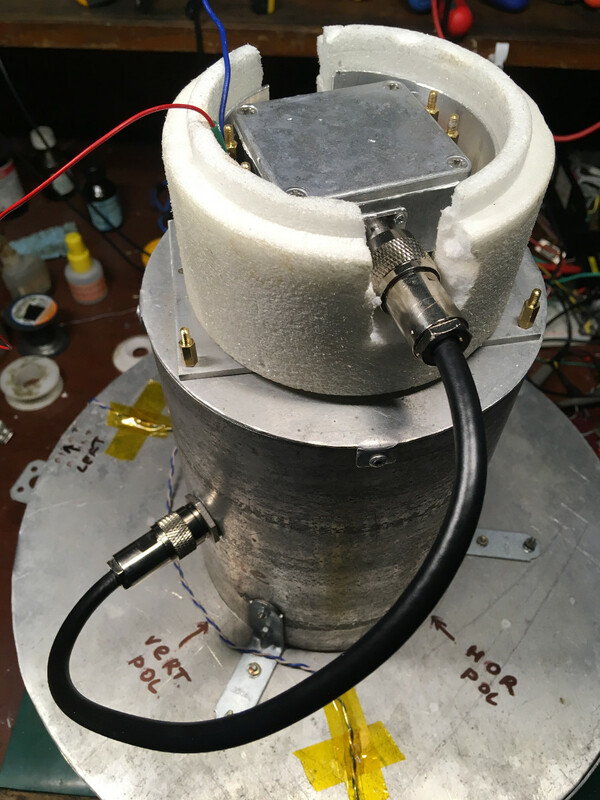 First successful tests was in August 2017. On the video below you can wideband noise from the Sun and signals from the INMARSAT satellites. I’m moving this antenna manually to slide on all this objects. As receiver can be used wide range of the SDR, RTL-SDR with a few hw mods (cooling + power filtering), for example. Hydrogen line 21 cm is extra weak so it’s really hard to get and collect signal. I spent some time to scan narrow line on the night sky. All collected data were summarized and I’ve got this picture of the signal fluctuation. Picture was projected to the actual view of the sky at that time. Few notes about polarization of the signal. Polarization is actually relative thing and depends on the actual position of the transmitter and receiver and where is “up” and “down”. It’s very important for the artificial signals. In case of space signals vertical or horizontal polarization doesn’t make sense so you can place you probe in the waveguide at the any angle you wish. All this natural signals can be even non-polarized or partially polarized or polarized by the some way. Polarization factor is very important for astrophysics and if you wish to measure polarization you need to build polarimeter. Another interesting experiment (with the new LNA) is acquisition signals from the Moon. You can enable English subtitles in the video below. My method to find dish focal point is to make an aluminum tape cross on the dish and then point at the sun as you have. It’s still tricky but the increased reflectance and structure of the cross of light helps in finding the focal point. Yes, it’s very good idea! Next Next post: Getting Linux routing table using netlink.